Ask any designer about the power of colour psychology in web/graphic design and they should start droning on about how each group of colour has a different effect on the user’s perception of the designed goods. But how aware of colour are we? Mostly, we overlook the psychology of colour in everyday life – mainly because we take it for granted and subconsciously associate colours with an emotion or vague snippet of what someone once told us in design school. But if we think about it, perhaps they play a bigger role than we realise. 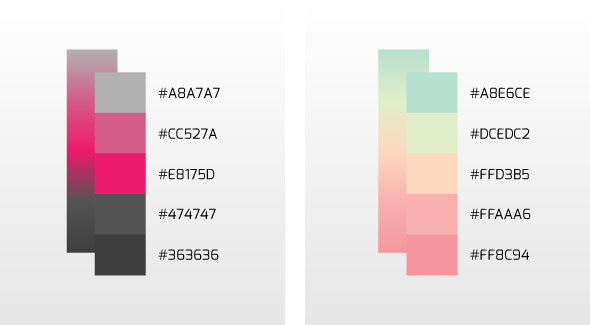 Let’s get a general idea of how colour is perceived. Red – love, passion, excitement, danger, action, warning, adventure, desire, impulse and intensity. Orange – comfort, warmth, creativity, spirituality, fun, youth, enthusiasm, celebration and in website designs, this colour is also associated with affordability. Yellow – attention grabber, warmth, liveliness, energy, curiosity, joy, playfulness, optimism, sunlight, gold, idealism. Green – nature, health, life, harmony, tranquility, good luck, money, optimism, durability, freshness, fertility and jealousy. Blue – calmness, serenity, peacefulness, security, stability, honour, trust, professionalism, success, seriousness and power. Purple – power, royalty, nobility, wealth, luxury, wisdom, spirituality, magic, mystery, dreams, fantasy as well as with ambiguity and uncertainty. Pink – tenderness, romance, love, youth, innocence, softness and it’s known to have a calming effect. Brown – natural colour, relaxation, endurance, reliability, confidence, warmth, comfort and security. Grey – neutrality, indifference and it leaves the impression of seriousness and conservatism. White – purity and innocence, cleanliness, simplicity and newness. Black – stylish and elegant. Also associated with sophistication, strength, mystery, depth, gloom, death, unhappiness, evil and sexuality. We see a lot of softer, pastel colour starting to make its merry way back in to the scene. Ignore the brightness for a second. Notice how the colour combinations (bright as they may be) are carefully put together so as to NOT give one a migraine while staring at their screen. It’s about curating. Being selective. 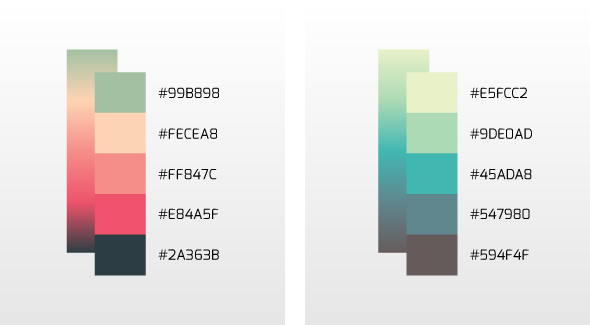 Knowing (or Googling) what colour combos work well with each other.